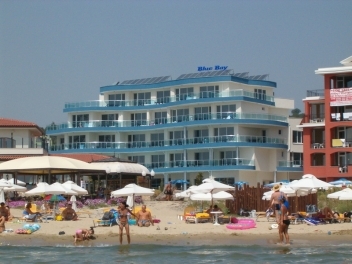 Sunny Beach is the most attractive Black Sea resort, situated in the Southern part of the Bulgarian Black Sea Riviera. This is one of the few places along the Black Sea coast where one can still enjoy the genuine well - formed sand dunes, mixed with the fresh air of the nearby mountain hills. The infrastructure of Sunny Beach is very well developed. The growing number of newly - built complexes reflects in a hidden competition for perfection and individuality, thus significantly improving the quality of the services offered. Golden beaches, crystal clear sea water, relatively high average temperatures of 27 - 28 C during the operational season, as well as a magnificent combination of sea and mountain views, transform the complex into an unmatched place for a perfect summer holiday. There is a huge variety of dining and entertainment facilities - a long list of restaurants and pubs, which offer traditional Bulgarian and international cuisine, as well as modern night clubs, discos, beach bars, etc. One can explore professional fitness centers, mini golf courses, tennis courts, beach volleyball, football, volleyball playgrounds, as well as to experience high adrenaline sports, such as surfing, water skiing, kiting, deltaplanerism, and parachutism, yachting and many more. Hotel BARCELO ROYAL BEACH Ideally located into the heart of the resort, Barcelo Royal Beach offers highest quality of accommodation facilities and services. Accommodation: Totally 294 units distributed into 136 modern double rooms, 150 classic apartments, 6 DeLuxe Junior Suites and 2 Presidential Suits. 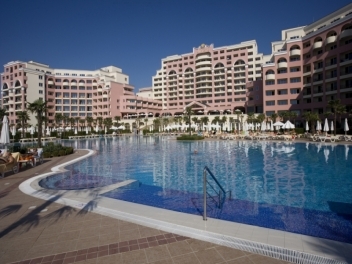 VIKTORIA PALACE is situated on the very beach in the northern part of Sunny Beach resort. Accommodation: 1 presidential suite, 42 suites, 2 penthouse suites,16 single and 475 double rooms. 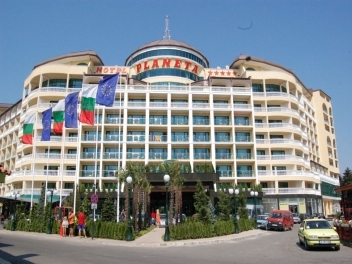 Hotel PLANET is the newest shelter of luxury and calmness in “Sunny Beach”. The biggest Bulgarian resort has its place of first class, offering coziness and service of five stars. Accommodation: 346 double rooms,63 studios with a kitchen corner, 28 family apartments. 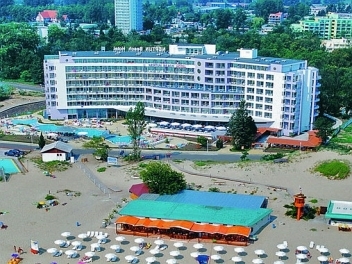 The for-star Hotel CHAIKA BEACH is located right at the beach line, facing the resort promenade. Accommodation: The hotel dispose of 2 VIP suites, 14 spacious suites, 100 studios, suitable for families, 299 double rooms, 8 single rooms. All rooms have telephone, SAT TV, mini bar, bathroom with bathtub and hairdryer, air conditioning. Most of the rooms are sea-view and have balconies. The Chaika Resort offers an ideal location just metres away from the inviting golden beach and is situated on the lively main resort promenade. It comprises of 3 hotels - Chaika Beach, Arcadia and Metropol. Arcadia and Metropol were both fully renovated for summer 2008. 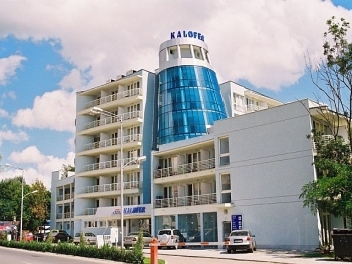 Karlovo Hotel is completely renovated and modernized in 2011, according to the requirements for hotels 3 and 4 stars. It has 5 floors, of which four are hotel and ground, where are located the reception, lobby bar, restaurant, nursery for classes, study with a holistic massage studio. 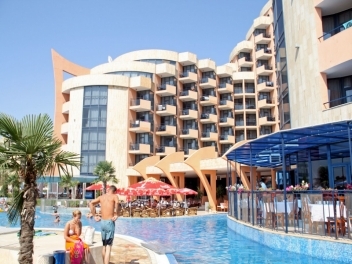 The four star Flamingo is situated in the northern part of Sunny Beach, 200 mts from the spectacular beach, the shops, restaurants and bars. The hotel is bright and airy with well-appointed guest rooms and the ambience is relaxed and informal. 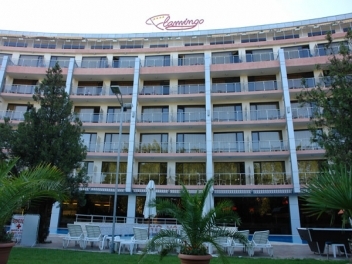 Accommodation: Hotel Flamingo has 158 double rooms, 16 of them - family rooms. 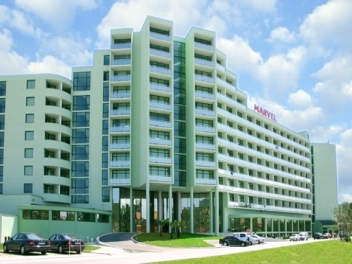 This modern hotel is situated in a quiet area of Sunny Beach. It offers comfort and a range of on-site facilities and is only a short stroll away from all the resort has to offer. Fiesta Beach is the perfect holiday choice. Alba hotel is one of the most modern and stylish hotels with first class facilities. 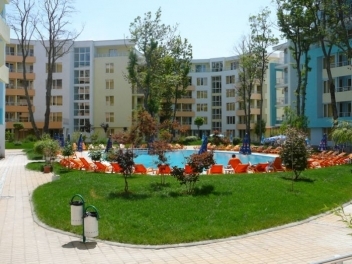 Fantastic location – in the very heart of Sunny beach, on the main promenade and so close to the brilliant beach (no more than 50 meters). A great choice of eateries and bars, well trained staff, a great variety of children’s and adults’ attractions, and a lot of entertainments’ around make you feel at your best and relax. 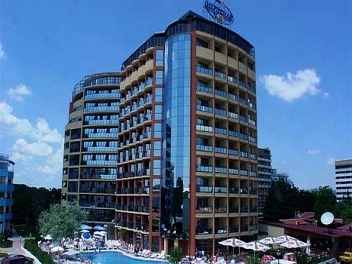 This 4-star hotel is situated near the south-centre of Sunny Beach. It has 268 rooms on 10 floors. The distance from the beach is about 200m. and from the nearest entertainment around 300m. The hotel is also easily accessible by public transport, only 20m. away from the nearest bus-stop. The four storey DIAMOND is always popular with the holidaymakers and really does give excellent value for money. It is one of the best hotels within its category. Located about 250m from the beach. 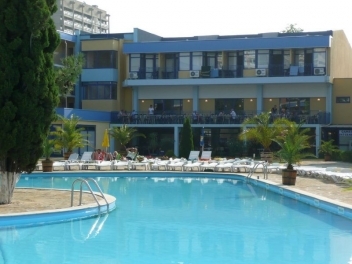 HOTEL MARVEL is situated in the near the highway Burgas - Varna,35 km from Burgas airport and 100 km from Varna.The hotel is situated in the north part of Sunny Beach,in the close proximity of the beach and the picturesque sea path. 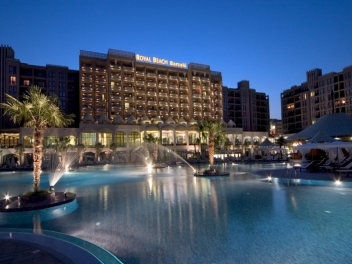 Hotel MENA PALACE is situated in the heart of Sunny Beach-you can enjoy the inside & outside pools,bars,restaurants and summer garden, childs playground,sauna and fitness,massage studio, rent-a-car and real estate services. 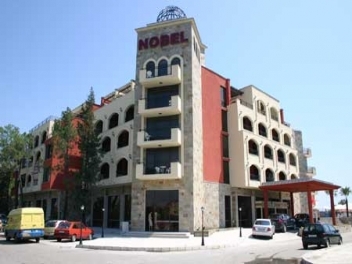 Nobel Hotel is situated near the highway Burgas - Varna, 35 km from Burgas airport and 100 km from Varna. 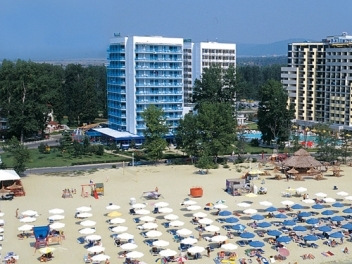 The resort is spread out along the Black Sea coastline among the unique nature attraction - the dunes. The SUN CITY hotel is located only 250 meters from the nearest sandy beach and just under a mile from the centre, shops, bars and restaurants. The Hotel has 80 rooms spread across 4 floors. There is a bus stop and supermarket within 100 meters of the property. There are plenty of facilities on the beach for the energetic or for those who just want to relax. Hotel LIANI has opened doors for month and it 's all new. It 's located at the center of Sunny Beach. In the hotel is nicely and calmly. There are swimming pool and parking. 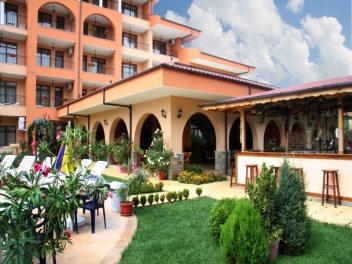 Hire you will been received with special care and with sure hotel "Liani " is the best place for your vacation. The hotel has 26 two-person rooms, 3 three-person rooms and one flat. 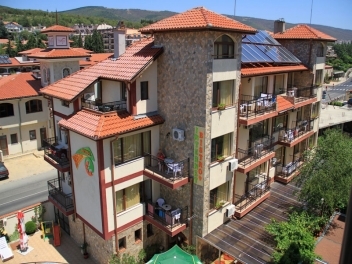 Kotva Hotel is situated on the southern part of Sunny Beach Resort, 250 meters from the beach, 3 km from the centre of the resort, 800 meters from the town of Nessebar and approximately 20 km from the airport. It is an ideal holiday destination with many facilities to ensure ultimate comfort and an enjoyable stay. The hotel’s state-of-art building is just 100 meters away from the beach line and 300 meters from the resort’s centre. Available to the visitors of Perla are a total of 80 double rooms and 3 suites. 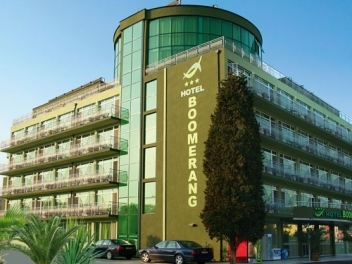 The Boomerang Hotel is situated in the centre of Sunny Beach resort, 350 meters from the beach, close to the central bus station. It provokes you to spend your summer holiday in its distinguished and cosy atmosphere. The guests may sunbathe either on the sandy beaches of the resort or around the hotella`s swimming pool, making the most of the hotella`s bar, restaurant and shop. The popular CONTINENTAL has one of the largest swimming pools in the resort and a good selection of on-site facilities. Hotel offers 330 double rooms – 2* and 100 double rooms – 3*. 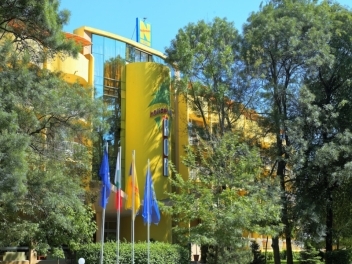 The three-star part of the hotel is renovated in 2000. The furniture and decor of the rooms in the 2 star accommodation is functional and may not appeal to someone looking for a hotel with modern conveniences. The Golden Sandy beach is only 300 metres away. This hotel offers everything you need for an enjoyable holiday. A spacious swimming pool area enhances the hotel’s appeal. Guests can benefit from a 10% reduction in the hotel's restaurant. 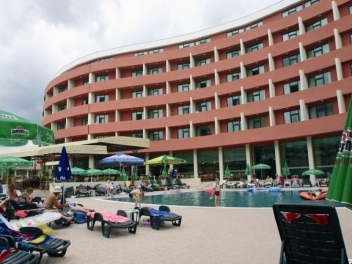 Apart-hotel “Grenada” is located in the southern part of Sunny Beach, in the immediate proximity to the seashore. 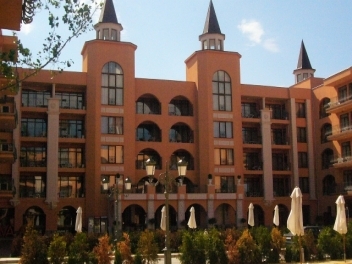 The complex is located on 1,5 km distance from the city of Nessebar with its historical and architectural sights. “Grenada” is a fashionable complex with a modern architectural style. The smooth harmonically curved shapes merge with its massive buildings presenting delightful colors. Charm and relaxing atmosphere of a contemporary palace are typical for this apart-hotel, centrally situated in the most atractive and frequented Bulgarian sea resort. 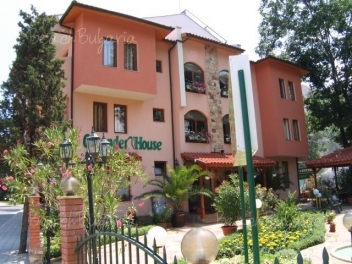 Oleander House and Restaurant is a heavenly place situated in the central part of Sunny Beach. The hotel offers 22 double rooms and 4 apartments. The hotel offers to guests also a lobby bar, a parking lot and 5 tennis courts and a mini-golf course.The restaurant has an outdoor and an indoor part and offers a variety of Bulgarian national and European dishes. Perfect place for a perfect holiday. 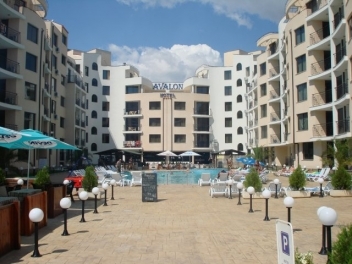 The new hotel Complex “A V A L O N ” is situated in the west part of the famous Black Sea Resort – Sunny Beach/ opposite of Meridian hotel on the mine road, 150 m. from the beach and 800 m. from the resort centre . AVALON will open in May 2008. Hotel Complex “A V A L O N ” offer 45 Double rooms,35 Family rooms and 70 one bedroom Apartments and 20 two-bedroom Apartments. In this up and coming resort lies the Sunny Day, situated in close proximity to the beach and the nearest shops and eateries. 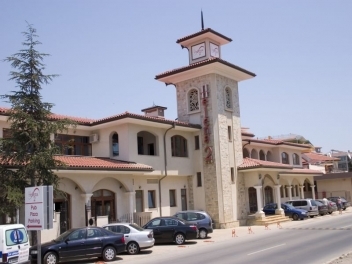 There's a bus stop right outside the hotel which will take you into the nearby resort of Nessebar, or alternatively you can spend the day relaxing on the beach or wander into the centre of the resort taking in a bar or restaurant along the way. 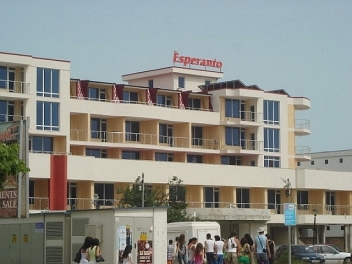 Esperanto is a quality development of 70 four-star hotel rooms and 49 luxury apartments with beautiful sea & beach views. The hotel is situated just 40m from the pretty beach and a short stroll from the bustling centre, this charming property represents the ideal base for relaxation and exploration. 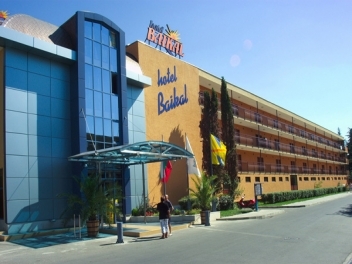 Hotel Baikal is situated about 500 m from the centre of the resort and 150 m from the beach. 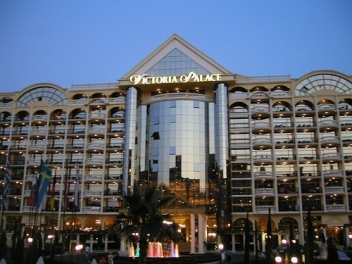 The hotel complex consists of 4 wings of various height - 3, 4, 5 and 7 floors. Featuring an outdoor pool, fitness centre, and spa, this 3-star hotel features air-condoned rooms with a balcony overlooking the rose garden. It is 200 metres from the centre of Sunny Beach and 50 metres from the promenade.Regina Hotel is 50 metres from beach and the bus station connecting to Bourgas and Nessebar. 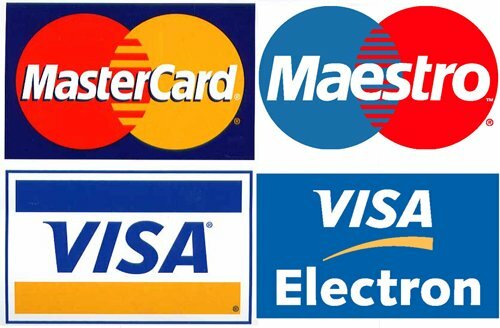 Car rental is provided by the 24-hour staff and private parking is available. 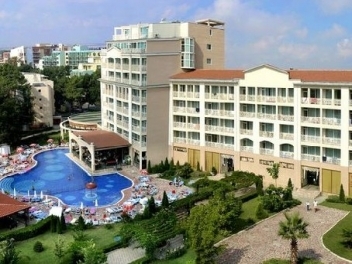 Palace hotel is located on the first line of hotels in Sunny Beach resort. The hotel offers double rooms standard and VIP apartment. The Carina Hotel is in the first sea line, it borders onto the sand stripe and has a unique view along the entire Bay. 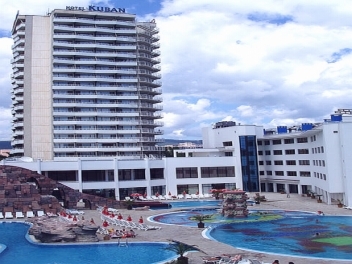 It is situated in the quietest part of Sunny Beach and is in the immediate proximity of the emblem of Sunny Beach – the 5-star Helena Resort Hotel. 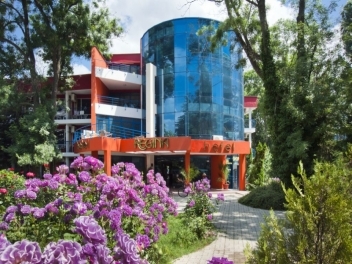 Club hotel “Bor” is situated in a quiet, own, beautiful park on the territory of the Sunny beach resort. It is about 150m long distance to the breathtaking beach and it’s in the heart of the resort, near to all the attractions, shops, center, discos and bars. The quality of our product, the multiple kitchen and the friendly service are creating club hotel “Bor” in a recommended place for vacation and leisure not just for our old guests, but also for many young families. 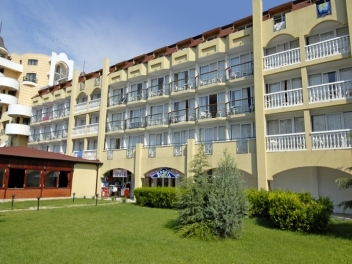 The hotel is situated in a quiet part of Sunny Beach West, only 350 meters away from the beach. The hotel has 3 wide and comfortable double rooms with one extra bed available and 5 apartments. 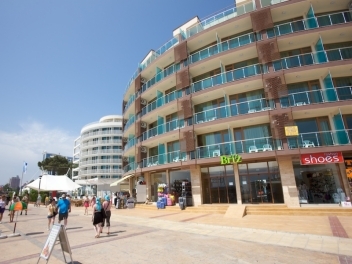 The Briz Beach hotel is situated it the close proximity of the beach strip of the resort complex Sunny beach. Pure water,silk soft golden sand, pleasant, lightly blowing sea breeze and filled with vitality atmosphere,will make your summer holiday unforgettable. 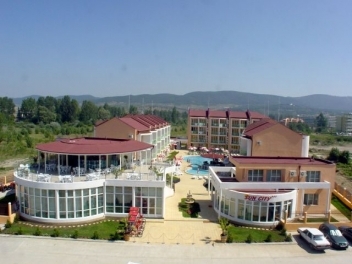 St. Valentine complex is situated several minutes from the heart of the resort, 200m from the beach and 10 min walk to the center and Kuban hotel. ILKA Family Hotel is a stunning, newly built family hotel, situated in Sunny Beach’s finest part, within the holiday area “Dolphin”. 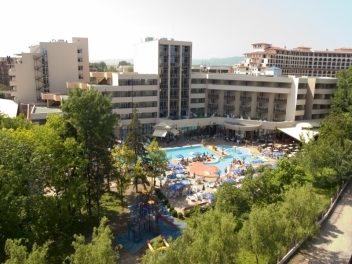 The hotel is located close to the pearl of Sunny Beach - Helena Resort and less than 100 metres from a spectacular, miles-long gold sandy beach. 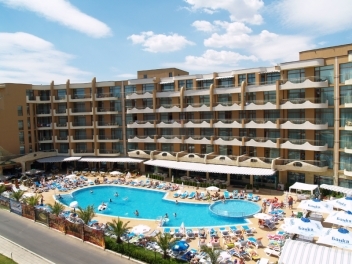 The Condor hotel *** is positioned in the prestigious northern part of Sunny Beach , only some 50 meters from the peaceful beach. The hotel boasts with elegant architecture and contemporary design and pleasant sea views. The Yassen Holiday Village is located 70 metres from the beach and a 5-minute walk from the centre of the Sunny Beach resort. It offers a pool and free, guarded parking. All apartments are air-conditioned and have a kitchenette and a balcony. A restaurant serving tasty Bulgarian and international cuisine and a supermarket are located on site. For the kids there is a shallow pool and a playground. Various excursion can be booked at the reception. 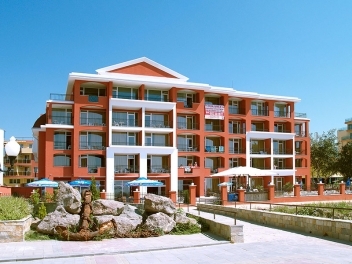 Amphora hotel complex is located in the southern part of Sunny Beach resort and is about 1 km from the unique town of Nessebar. It is situated next to the beach area. 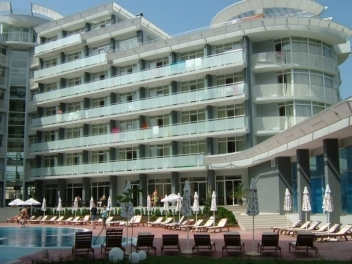 Hotel Helena 2 is located in one of the most environmentally clear zone in Sunny Beach. The climate in this zone is a result of a very rare combination of mountain air flow with a sea breeze .As a result of that the air becomes ionized and clear. This environmental effect makes our place suitable for prevention, rehabilitation and treatment of many respiratory problems or just to enjoy the magic of the clean air. Some of our guests told us about reduced symptoms of so called “HBP”. The beach in our part of the complex is always free as a space to be used, unlike the central and southern zone where tourist crowded with holiday makers!!! 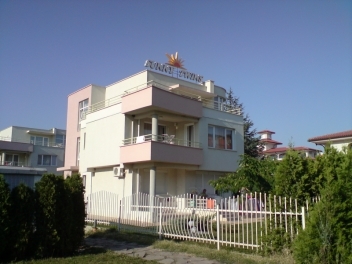 Hotel “Breza” is situated in the north-east area of the holiday resort on Sunny Beach. 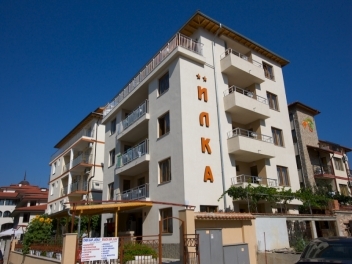 Only 50 meters from the beach with all rooms facing south giving pleasant sea and mountain views.